The 40th SIGGRAPH International Conference and Exhibition on Computer Graphics and Interactive Techniques has begun! This past Sunday crowds gathered for a behind-the-scenes look at the artistry and technology that went into Pixar's latest feature short, The Blue Umbrella given by Director Saschka Unseld. The schedule continues this week with many more Pixar centric topics, from Global Illumination, Monsterous Advancements in CGI to learning about new features within RenderMan that was used on The Blue Umbrella. In addition, to the incredible speaker schedule at this year's SIGGRAPH - Pixar Animation Studios will celebrate 25 years of Pixar's RenderMan with commemorative User Group meetings and presentations to be held during the conference. RenderMan will also have their coveted Walking Teapot on-hand to giveaway which features "monstrous" detailing as seen below in this sneak peek photo. EMERYVILLE, CA – (Monday July 22nd, 2013) PixarAnimation Studios today announced a celebration of 25 years of Pixar’s RenderMan to be held at SIGGRAPH 2013 featuring events that will include a commemorative Users Group Meeting and a number of special presentations demonstrating how RenderMan has been used in this year’s most successful visual effects blockbusters and animated features, including Pixar’s “Monsters University” (and the accompanying short “The Blue Umbrella”). Pixar’s RenderMan Studio 18 will be prominently featured, showcasing the most recent developments in Pixar’s rendering technology, including major advances in photorealistic global illumination. "Geometry lights are awesome!" said Mitch Prater (LLC), Shading System Architect for Laika VFX. "It's a fantastic achievement with geometric area lights that have tons of great features, better sampling for faster and better results, interactive path tracing, and expanded controls and shading information access. It's a huge step up from 17." Over the past 25 years, RenderMan’s pioneering contributions in computer graphics have dramatically transformed the animation and visual effects industry, establishing an unparalleled body of knowledge, expertise, and production insight into all aspects of rendering at the highest levels of cinematic realism. Pixar’s RenderMan today is responsible for generating more film pixels than every other solution combined and has become the standard for cinematic photorealism, used in 19 out of the last 21 Academy Award® winners for Visual Effects. Continuing to build on the advances embodied in the recent release of RenderMan 18.0, Pixar’s RenderMan team is currently developing new paradigms for rendering high-level visual effects, retaining all of the traditional strengths of RenderMan while establishing new levels of ease of use and accessibility. 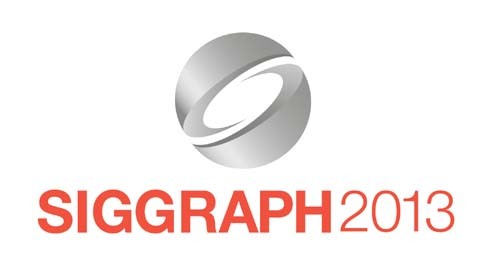 From SIGGRAPH 2013 onwards, a series of additional special events and software release announcements will highlight how RenderMan continues to change the way in which movies are made and why it is relied on by studios worldwide. 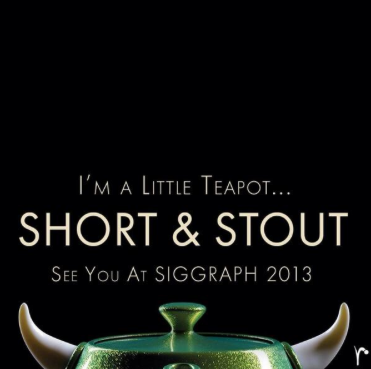 Pixar’s SIGGRAPH 2013 booth (#433) in Anaheim will feature regular demonstrations of the very latest RenderMan technology and products. The annual RenderMan Users Group meeting will be held on Wednesday, July 24th at 6:30 P.M. in the Hilton Anaheim Hotel. For more information about the programs commemorating RenderMan’s 25th anniversary please visit Pixar’s booth or contact rendermansales@pixar.com. Want to learn some more about the tea pot - why it was designed, the story behind the multiple versions as well as why the pots are numbered? Check out this video featuring the pot's designer, Dylan Sisson. Another challenge that Docter shared was character development and animation, “The characters are created with this energy because we are trying to represent what emotions would look like. They are made up of particles that actually move. Instead of being skin and solid, it is a massive collection of energy." This is the first confirmation we have heard regarding the appearance of future characters for this film and we must say - we are excited! 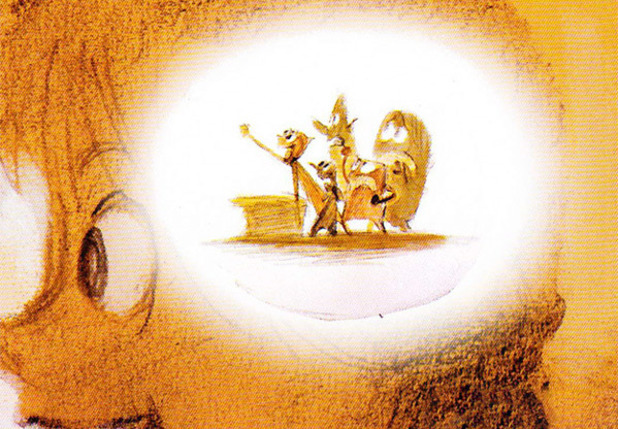 To know that the characters are based on emotions is sure to make this film a relatable classic Pixar film! We also started a forum discussion on Pete Docter's comments and our theory on the story and character elements - let us know your thoughts and theories.